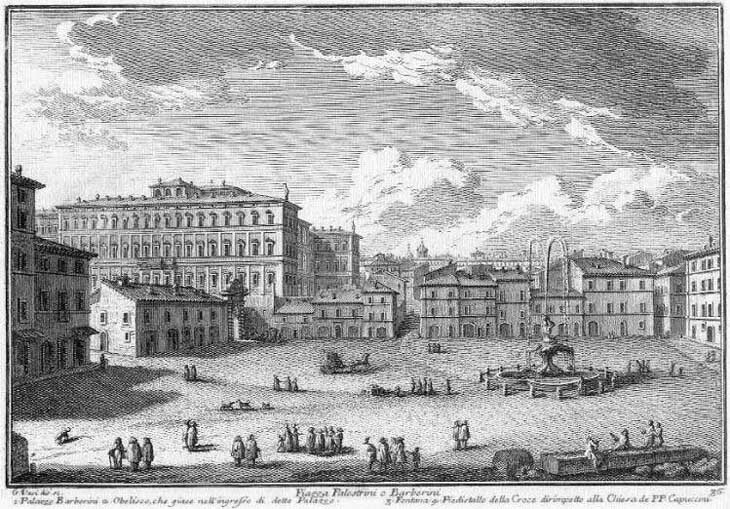 The caption below the etching says Piazza Palestrini o Barberini, because the Barberini had the title of Princes of Palestrina, a town in the Roman countryside. In the right lower corner of the plate Vasi shows an obelisk which was not in the square, but near the entrance to Palazzo Barberini. The obelisk was found in 1570 outside Porta Maggiore in an area which was part of a residence built by Emperor Heliogabalus; in 1633 it was relocated to Palazzo Barberini by order of Pope Urban VIII. The obelisk was erected by Emperor Hadrian to celebrate Antinous, his favourite. Its original location is uncertain; some believe it was placed on a terrace near S. Sebastiano al Palatino, from which it was removed by Heliogabalus who built a temple to the Sun there; others suggest it was erected in Villa Adriana. Notwithstanding several projects, the Barberini never re-erected the obelisk and eventually in 1773 they donated it to Pope Clement XIV, who temporarily stored it in Cortile della Pigna; eventually in 1822 it was placed in the Pincio Gardens. Perhaps Dan Brown glanced at this etching because in his novel Angels and Demons he wrote that "a multiton obelisk stood in the centre of Piazza Barberini" (for more about Dan Brown's accuracy click here). The view is taken from the green dot in the map below. 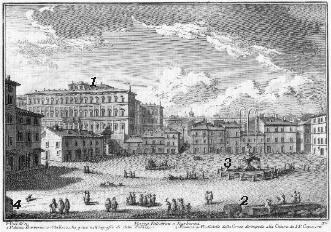 In the description below the plate Vasi made reference to: 1) Palazzo Barberini; 2) The Obelisk in front of the palace; 3) Fontana del Tritone; 4) The pedestal of the cross in front of Convento dei Padri Cappuccini. 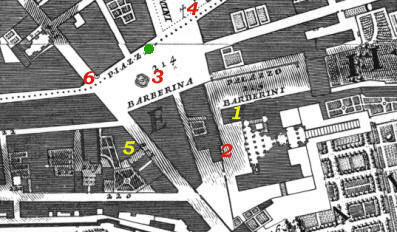 The small 1748 map shows also 5) S. Andrea degli Scozzesi; 6) the site where Fontana delle Api was located. 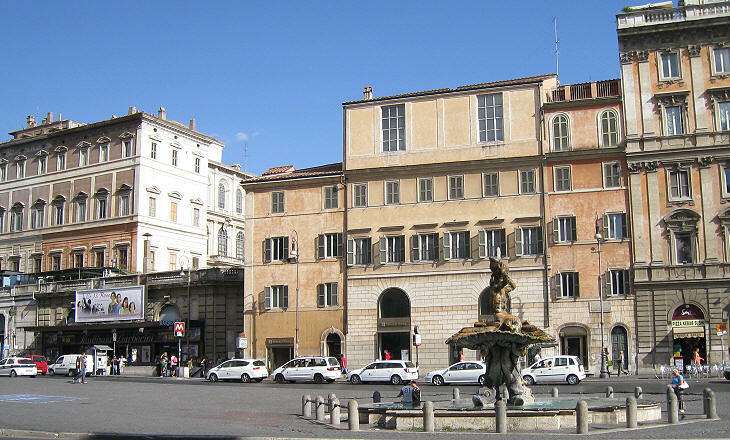 In the XVIIIth century Piazza Barberini was at the limit of the populated part of the city; the area between the piazza and the walls of Rome was mainly occupied by villas, the largest one being Villa Lodovisi. In the late XIXth century these villas were replaced my modern quarters and Piazza Barberini sees today a continuous flow of cars going to and from these quarters and the city centre. Via del Tritone, the narrow street which linked the piazza with Piazza Colonna was enlarged. These changes have not affected Fontana del Tritone and Palazzo Barberini. The fountain is one of Gian Lorenzo Bernini's masterpieces; it was commissioned in 1642 by Pope Urban VIII. Bernini was paid with the right to a supply of water from Acqua Felice, which the architect used for two houses he bought nearby; the supply which exceeded his needs was resold to other landlords. The spout was much higher than it is today. 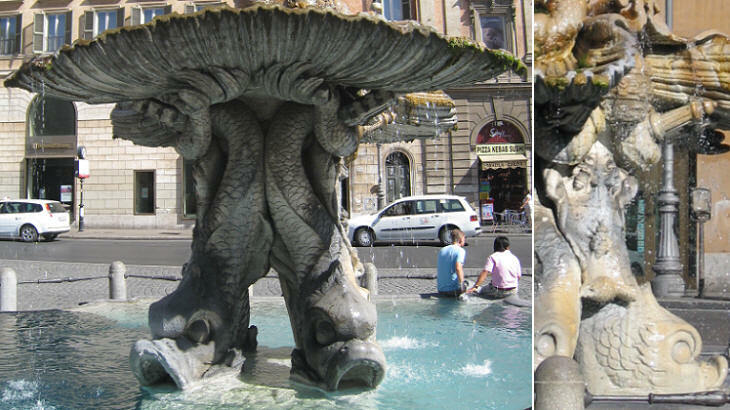 The design of Fontana del Tritone influenced that of Fontana dei Quattro Fiumi in Piazza Navona; the four dolphins which support the upper part of the fountain leave an empty space which also characterizes the later fountain and the same applies to the location of the papal coats of arms. The excess water is "drunk" by the dolphins; in the later fountain this is done by a big fish. Cardinal Matteo Barberini lived in a palace in Via dei Giubbonari, which, after he became Pope Urban VIII in 1623, he assigned to his brother Carlo. This palace was not suited for the new role of the Barberini; Taddeo, a son of Carlo Barberini, at the insistence of his uncle, in 1624 married Anna Colonna, who belonged to one of the most ancient Roman families and who brought to her husband a substantial dowry and in 1629 the fiefdom of Palestrina. In 1627 Taddeo Barberini commissioned Carlo Maderno the construction of a new residence which was to include a small palace the Barberini bought from the Sforza; the architect was assisted in his activity by Francesco Borromini, a young relative. Initially Maderno designed an imposing building with a long façade; because of the sloping ground he then modified the initial project by reducing the length of the façade and by adding two wings. At the time of the death of Maderno in 1629, the Barberini asked Gian Lorenzo Bernini, a member of their inner circle, to finalize the construction of their palace. 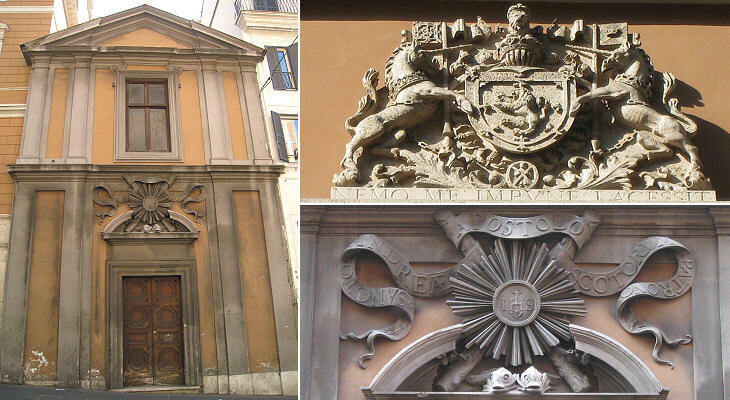 Bernini worked with the assistance of Borromini and thus it is not always evident what was designed by Maderno, by Bernini or by Borromini; the small windows on the second floor and the coat of arms are generally attributed to Borromini. At the death of Maderno most likely the portico of the ground floor was already built or its construction was in an advanced phase; its design followed a classic pattern which can be traced back to Colosseo. The hand of Bernini and his attention to optical effects, can be seen in the loggias of the first and second floor; the latter in particular shows the use of a fake perspective in the design of the windows, a feature which characterized many future works by Bernini and Borromini. The final result is a totally new façade which is designed more for a villa than for a city palace; because of its location and its gardens Palazzo Barberini could very well be called Villa Barberini. 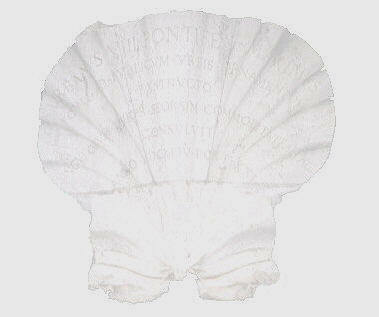 The decoration has several references to the heraldic symbols of the Barberini: the bees and the sun. 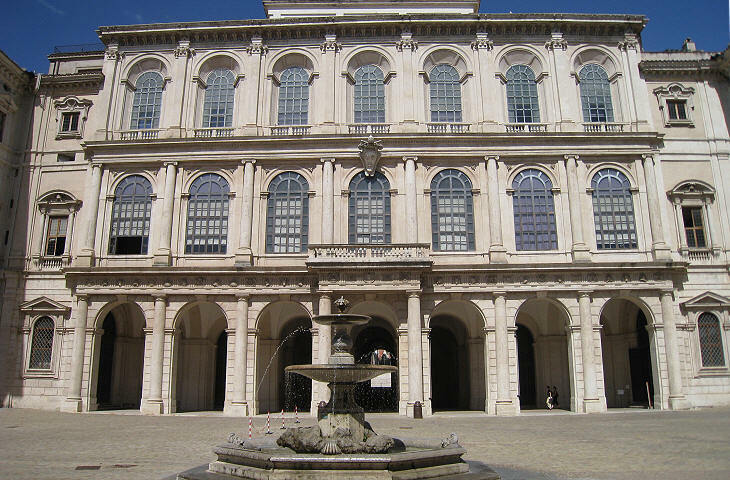 Today Palazzo Barberini houses Galleria Nazionale d'Arte Antica. Two stairs lead to the main apartment. The larger one was designed by Bernini, whereas Borromini was entrusted with the smaller one: this has an elliptic shape. 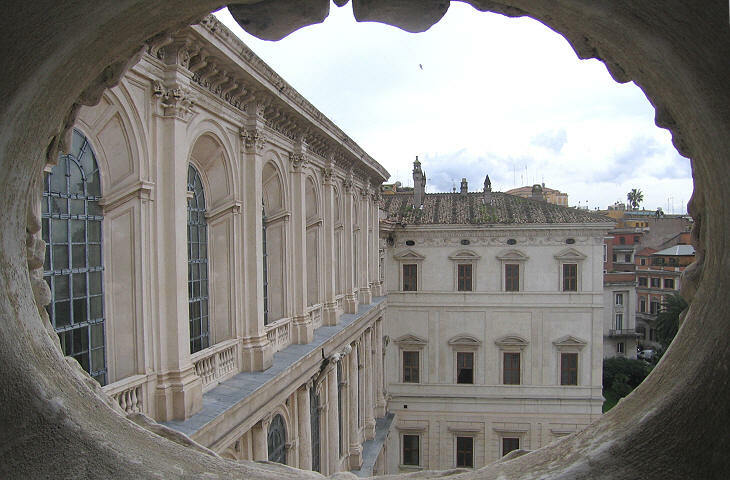 The use of ellipses rather than circles is one of the elements which characterizes baroque versus Renaissance architecture. Borromini showed here that passion for curved lines which would be a constant feature of his work and for which he would be reproached by Neoclassic art historian Francesco Milizia (Memorie degli architetti antichi e moderni - 1781): Questo artista non poteva soffrire il retto (this artist could not stand straight lines). 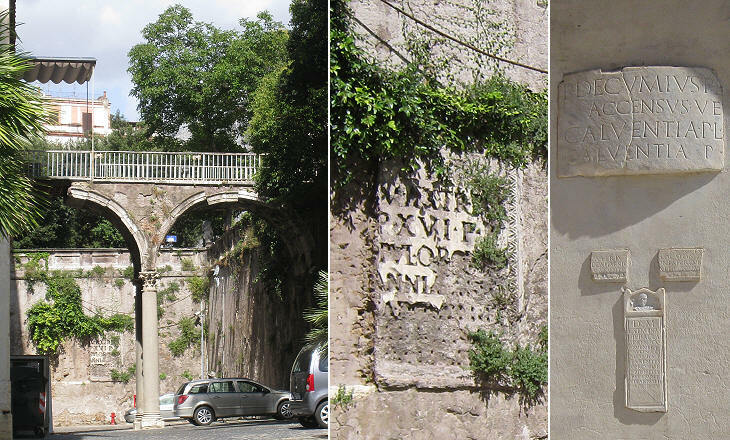 Pope Urban VIII moved the obelisk to his family palace with the idea of placing it next to Ponte Ruinante (falling bridge), an unusual bridge designed for him by Bernini. The bridge had two objectives: one was very practical, i.e. to provide the palace with a direct access to the upper part of the gardens; the other one was to add yet another memento of ancient Rome to the many already existing in the gardens. To this purpose Bernini designed a bridge with one arch which is in part collapsed and the other one with the stones of the vault on the verge of falling. 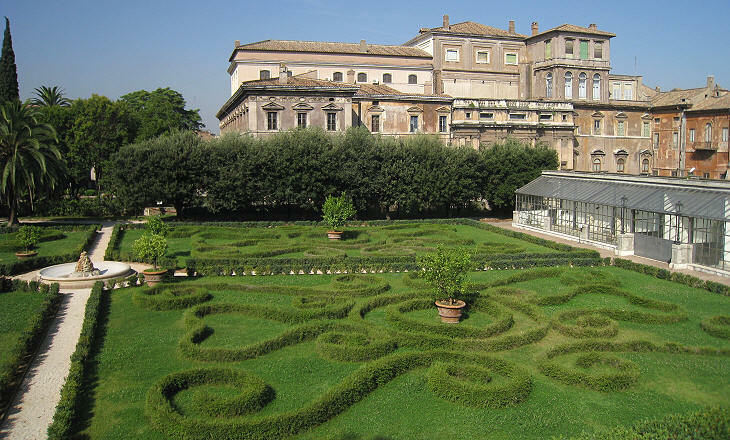 In the late XIXth century the Barberini sold a large part of their gardens along Strada Pia and that which remained was not properly maintained. Recently, based on an etching by Alessandro Specchi (external link), the garden has regained its old design. 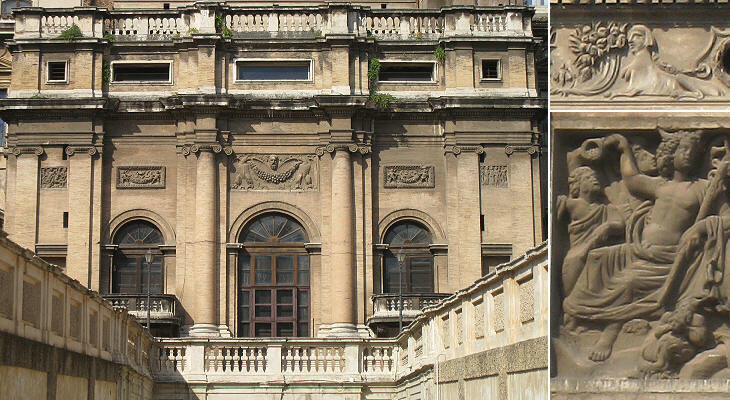 The rear façade designed by Maderno has many points in common with that he designed for S. Pietro; Bernini lightened it by adding some ancient reliefs. 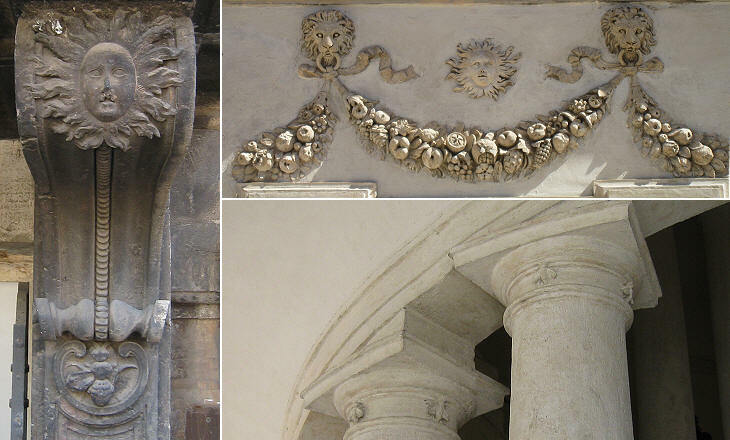 The rear part of the building includes Palazzo Sforza; in the cornice the Barberini added their bee to the quinces and sphinxes of the Sforza di Santa Fiora. 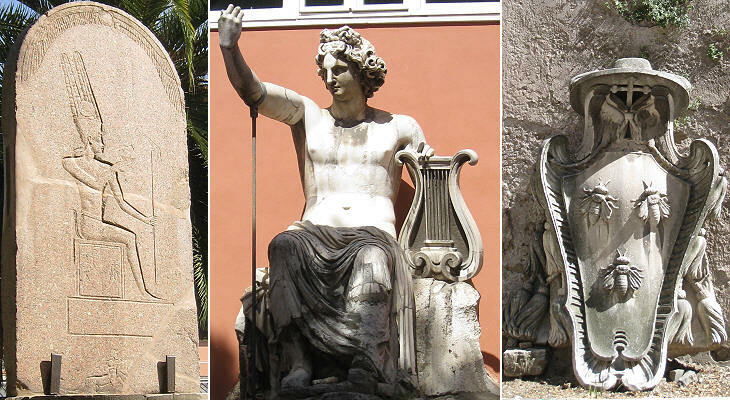 A large Roman statue of Apollo Citharoedus (playing the cithara, a kind of lyre) was found in c 1670 and it was restored/completed by Giuseppe Giorgetti. It was placed behind the low wall along the street going to S. Susanna and many XIXth century views of the area show the upper part of the statue; later on it was relocated in a niche at the end of the garden. An Egyptian stela is another ancient work of art which embellishes the garden. A gigantic coat of arms of a Barberini cardinal is now placed against a wall outside the palace; it is difficult to ascertain to which Barberini cardinal it belonged because Pope Urban VIII gave this title to his brother Marcello - also known as Antonio seniore - and to his nephews Francesco and Antonio (minore) and later on two other members of the family (another Francesco and Carlo) became cardinals. 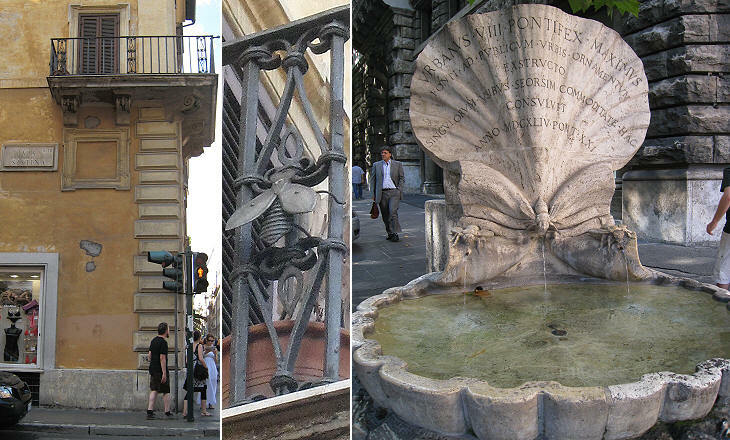 The last work which Bernini designed for Pope Urban VIII was a small fountain which was situated at the corner between Piazza Barberini and Strada Felice (this section of the street is now called via Sistina). The small palace under which the fountain was located belonged to the Barberini and its balcony still retains their bees. This fountain was built in 1644 because Fontana del Tritone was not suited for the needs of those who had to collect water from it; its high spout was very nice to see, but a sudden change of the wind could mean a shower for the women who were filling their jars. 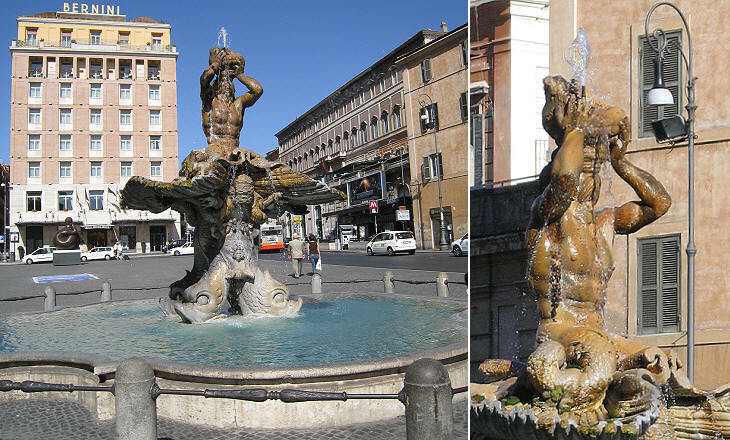 The different purpose of the two fountains is explained in the inscription; Fontana del Tritone was built ad publicum Urbis ornatum (for the embellishment of the city), Fontana delle Api singulorum utilitati (for the benefit of its users). The fountain was removed in 1880 and reconstructed in 1917 at the beginning of Via Veneto; parts of it had gone missing during the period the fountain was kept in storage and the inscription was incorrectly restored. The national church of Scotland is dedicated to St. Andrew, whose cross and two fishes (a reference to his job) decorate the façade. The church was built in the XVIIth century, but it became important in 1717, when James Francis Edward Stuart "The Old Pretender" (to the thrones of England and Scotland) set his residence in Rome. The nearby XIXth century building which once housed the Scottish Seminary is still decorated with the coat of arms and motto of Scotland. The church is in the street leading to the Quattro Fontane; regretfully in 2004 the church was deconsecrated: its paintings were moved to the new Scots College (external link) on the Via Cassia (click here for a list of national churches in Rome). Palazzo Barberini Dal Pontefice Urbano VIII. fu fatto questo magnifico palazzo con disegno del Cav. Bernini , il quale fece prova dell'alto suo sapere nella distribuzione delle scale diverse, degli appartamenti , ornati di superbe statue antiche e moderne , e di pitture insigni, fra le quali é ammirabile lo sfondo della gran sala dipinta da Pietro da Cortona , che va in stampa . Dinanzi a quello si vede disteso per terra un piccolo obelisco egizio , che dovevasi alzare nel giardino per fare ornamento al prospetto posteriore del palazzo. Piazza Barberini o Palestrina La deliziosa fontana, che adorna questa piazza fu pensiero del Cav. Bernino , ma da altri messo in opera.